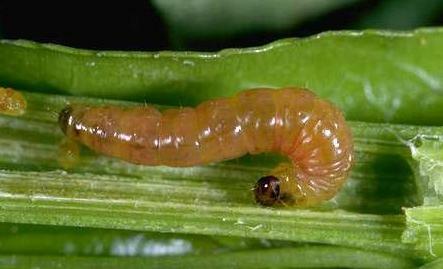 Region: This Caterpillar is found in eastern North America and the Pacific Northwest. Life cycle: This moth produces four to seven generations each year and hibernation occurs in its cocoon in bark or on the ground. Physical Description: This 1/2 inch long caterpillar is grayish white to pink with a brown head and brown marks on its thorax, and can usually be found in a white web. 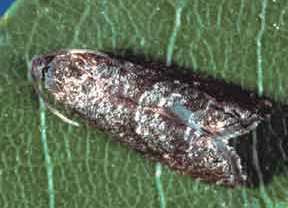 The adult moth is gray with brown markings and has a wingspan of 1/2 an inch. The flat,white eggs are laid on the underside of leaves or on twigs. Feeding characteristics: This pest attacks almond, apple, apricot, cherry, peach, pear, and plum plants by boring into young shoots or twigs early in the season, and then entering the fruit at the stem end later in the season. There is no visible signs of damage on the outside of the fruit, but there is extensive tunnelling inside. This pest is the cause of most wormy peaches. The first indication of an infestation is the wilting of the terminal leaves of rapidly growing twigs. It is not so easy to recognize infestations of the fruit. There may be a gummy substance on the surface, but most of this exudate is found inside. Controls: Survival of this insect is not good if late ripening fruit is not available, so choose a variety of fruit that ripen early. Prune poor growing twigs and keep the orchard clear of debris. Cultivate a couple of inches deep, one to three weeks prior to blooming. Remove culls from the orchard and destroy them. Dormant-oil DOES NOT control this insect. In many areas control can be achieved by using the Braconid Wasp. Release the wasps in four day intervals, for five intervals. Use six female wasps per tree and begin in mid-May. Bacillus thuringiensis to kill larvae. A spray of rotenone near the end of July will complete the treatment. A natural insecticide ryania is quite effective against this pest.